Summer Breeze is an annual, closed campus festival event on the campus of the University of Chicago. What made Summer Breeze 2018 unique to past years? Did MAB do anything different? Sampson (SO): This year, MAB decided we would try and change up our regular style of programming by bringing a pop headliner whereas usually we bring a Hip-Hop/RnB headliner. We wanted to make sure that we brought artists that were pushing the boundaries of their genres but more importantly, that our student body would be excited to dance to. Tempris (TD): Our organization is committed to providing an exciting yet different opportunities for our student body throughout their 4-year Summer Breeze experience. Was it MAB’s vision to do an all-female line-up? 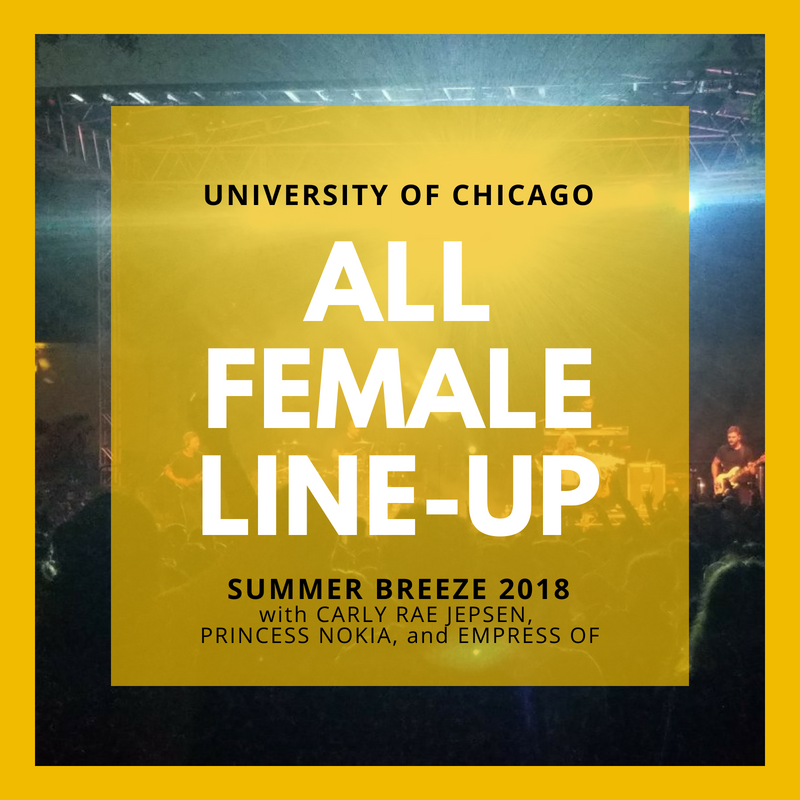 SO: Our primary concern as a Board is always to bring artists that we think are the most exciting and fitting for our campus but when it became clear this year that we had the opportunity to put together an all-female lineup, we decided to make sure that became a reality. Additionally, after bringing Mitski in the fall, another artist with a strong female voice, it felt fitting to continue the trend for Summer Breeze. What was the reaction to doing an all-female line-up before and after the date? SO: After we announced our lineup, the student body was incredibly excited and supportive. I definitely think that one of the factors that made this show such a success was people’s enthusiasm for the all-female lineup. TD: There was a large buzz on campus where students and staff felt having an all-female lineup sent a positive and reassuring message about female musicians. SO: MAB chooses artists by trying to find the best balance between critical success and mainstream popularity. We feel that it is our mission to put on a show that students are excited to attend while also giving them the opportunity to maybe discover a new artist or genre that they didn’t previously know about. TD: The process to pick our lineup begins in late November/ early December where we allow the student body and MAB organization to suggest artists they would like to see on campus. From there we work together to narrow the list and see who is available and would provide a great show on campus. What practices were used to promote this event? TD: Each year we release our lineup in a fun and unique way; always trying not to repeat our same release method. SO: This year, we released our lineup by placing three large CRT TVs on the main quadrangle and then in 15 minute intervals, a new artist would be announced on each TV. This fresh and exciting idea that our marketing team thought of was incredibly creative and a huge hit on campus. Other than that, we constantly promote our shows on social media, through word of mouth, and by putting up posters around campus. Did you face any challenges with this event and how did you overcome them? SO: One challenge that we face every year is making sure that our artists are as comfortable as possible to the best of our abilities. Given the number of people accompanying our artists this year was fairly high, a lot of logistics went into making sure they were all taken care of. Additionally, we did not have a car this year to pick up rider items so we had to be creative with our use of Amazon and Instacart. However, barring one member rushing to Target on a bike, everything ran perfectly. TD: From an advisor’s perspective, I think there is always this tricky balance where you want to make sure the artist coming to campus can provide a great show but will also provide a positive message to the campus. Sometimes this means saying no to a possible artist bid the organization wants to place, but other times it means getting really excited about the possibility of having the artist on campus. This year we went through such a fairly smooth process of picking female acts where the artists chosen even provided motivation messages to students during their performances. It was an incredible experience to witness. What was your favorite moment from this event? SO: My personal favorite moment from the show is when I heard the loudest collective scream I have ever heard on our campus after the opening notes of Carly Rae Jepsen’s first song. Obviously I was excited to watch the show, but I was more proud of planning an event that so many people were clearly enjoying. TD: From an advisor’s perspective, my favorite moment of the event was seeing the entire MAB team watch the beginning of Carly Rae Jepsen’s performance. At the University of Chicago, we spend the Thursday and Friday before Summer Breeze getting our stage, lights, and sound ready for the concert on Saturday. These are long days and the students are always committed to providing their time and working as a team to make sure everything is set for Saturday. Once we get to the point where the headliner starts their performance, the MAB students are exhausted but always find this burst of joy and excitement because after all their hard work done, they see their finishing product. It is fun as an advisor to watch everything come together because events like these are some of the best memories for students during their college years.